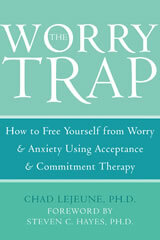 This book by Dr. Chad LeJeune presents a step-by-step approach to anxiety and worry which integrates the relaxation, thought monitoring, and exposure elements of CBT with the acceptance and mindfulness elements of ACT. Dr. LeJeune, a founding fellow of the Academy of Cognitive Therapy, teaches and speaks widely on the topic of CBT, and he has been an ACT practitioner for over 15 years. The book includes a forward by Steven C. Hayes, the founder of acceptance and commitment therapy. The Worry Trap presents a five-step model that can help you to interrupt the "control instinct" that is part of the fight-or-flight response and become more accepting of your thoughts and feelings while also becoming more focused on the present-moment and taking actions that are guided by your values rather than by the avoidance of anxiety.